Before anyone criticizes this review, let it be known that yes, I had seen the trailer for the movie before viewing it; yes, I knew it was going to be a "shoot 'em up" movie; and yes, I was aware that those types of movies generally don't have much plot. But is it so much to hope that perhaps it does have a decent plot, or at least one that doesn't have so many holes in it? 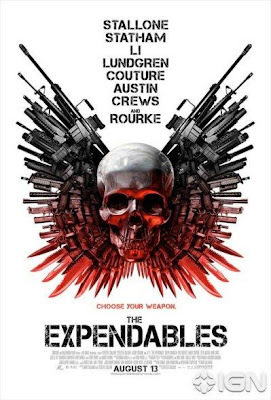 With "The Expendables," apparently yes. Barney Ross (Sly Stallone, "Rambo") heads the group called the Expendables, which includes Lee Christmas (Jason Statham, "Transporter 3"), Ying Yang (Jet Li, "Ocean Heaven"), Gunner Jensen (Dolph Lundgren, "Icarus"), Toll Road (Randy Couture, "Redbelt"), and Hale Caesar (Terry Crews, "Middle Men"). They are a group of rogue henchman who will take on any assignment, for a price. When a "Mr. Church" (Bruce Willis, in a cameo appearance) pays Sly and his gang $5 million to assassinate the dictator of a foreign country, they accept; when they get there and take a look around, however, they realize that the job is going to be much more complicated than they originally thought. Maybe see this movie. With such a great cast - Stallone, Statham, Li, and Lundgren - and Arnold Schwarzenegger, Bruce Willis, and Mickey Rourke in small cameo roles, I thought this movie was going to be awesome. However, the plot was weak, and the action scenes were long, gory, and a bit pointless. I found myself becoming disinterested even as Sly and his crew were slashing and shooting people to bits. All of the guys who I have talked to who have seen this movie have loved it, however, so that is why I believe it merits a "Maybe" review. Surprisingly, the audience at the theater was about half female and half male; this female, however, was bored during most of the movie, and wants her $5 back. "The Expendables" opened Friday and is currently showing in theaters.